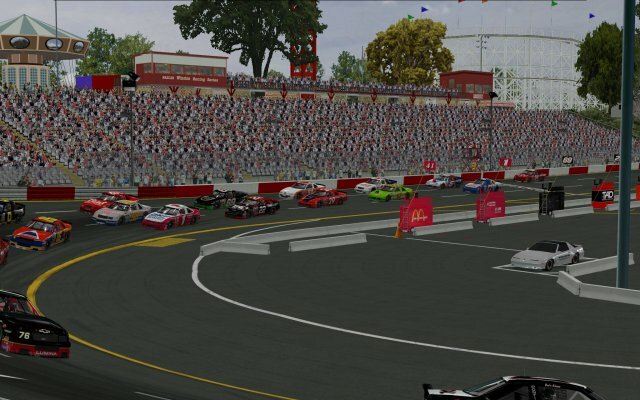 After over 4 years of tinkering, tweaking and fussing over, at long last here is Historic Riverside Park Speedway for NR2003! Located on the banks of the Connecticut River inside of the Riverside Amusement Park in western Massachusetts, Riverside Park Speedway was perhaps one of the most wildly popular and successful speedways in the entire country. 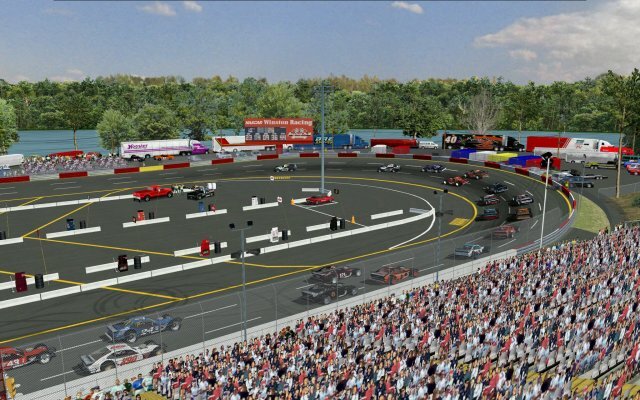 Every Saturday night up to 6000 fans would jam into the stadium of this tight little 1/4 mile oval to cheer on their heroes of the Northeast's premier racing division, the Modifieds. All of the top-named drivers including Wild Bill Greco, Richie Evans, Reggie Ruggiero and a host of others raced there. The track also featured thrilling T-Bone action of Figure 8 racing, Demolition Derbys, Late Models, Prostocks and other support divisions. Riverside Park Speedway packed 'em in for 50 years until in 1999 when the amusement park was sold and re-branded "Six Flags: New England. The track was closed down to make way for more amusement rides and it was indeed a sad day for New England racing fans that absolutely cherished this speedway. This project is has been a labor of love for me (JR Franklin) and was done with a nod towards all of the loyal fans who frequented "The Park". We poured as much detail into this track as was absolutely possible within the limits of NR2003. Former patrons of Riverside Park will see many of their old favorite rides in full animated glory... The "Colossus" Giant Ferris Wheel... The terrifying Tower Drop Ride... The dizzying "Centrifuge" ride... and of course the classic wooden "Thunderbolt Rollercoaster"! 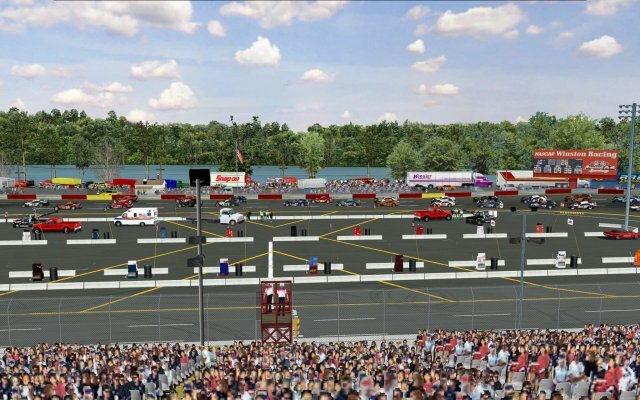 This recreation of Riverside Park features infield pitting for 23 cars just like it was set up when the major touring series like the Whelen Modified Tour and the NASCAR Busch Grandnational North Series visited The Park. It is an attempt to closely resemble the track as it appeared at times during it's 1990's "heydays". Making 1/4 mile ovals for NR2003 with working A.I. can be a very challenging undertaking. Especially for a sim that was originally only designed for tracks of 1/2 mile and up. There are several who helped me bring this dream to fruition: Bowtie Anderson, Ian Smythe, Carl "Riviera71" Sundberg and others. Please be sure to read about all of their contributions in the CREDITS README file provided with the track. There are also some very important notes in there about how to get the best results when racing on the track in NR2003. Following the park's 1999 season, Premier Parks, Inc. (the operators of the amusement park and speedway) made several major changes that directly affected the future existence of the speedway. The company re-branded the park to "Six Flags: New England" for the opening of the 2000 season. During this time, Six Flags permanently closed the speedway to make way for a spectacular new roller coaster, Superman-Ride of Steel. Much of the new coaster and more than half of the park's "D.C. Superhero Adventures" section, now sit on the land once occupied by the track's racing surface. Thus came the historic end of one of New England's most beloved racing facilities. 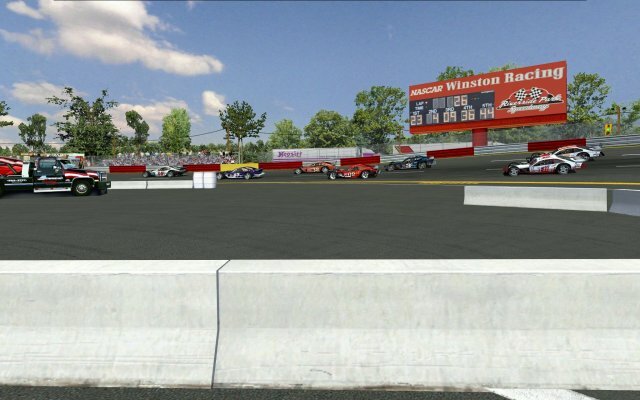 This NR2003 version of Riverside Park Speedway is an attempt to closely resemble the track as it appeared at times during the 1990's. It is not, however, an exact replica nor do the limits of NR2003 allow it to be. This project represents the culmination of over four years of work with many contributors. It is a tribute to all of the many fans who loved and visited Riverside Park and a small replica to help them relive those great times at one of New England's favorite tracks. 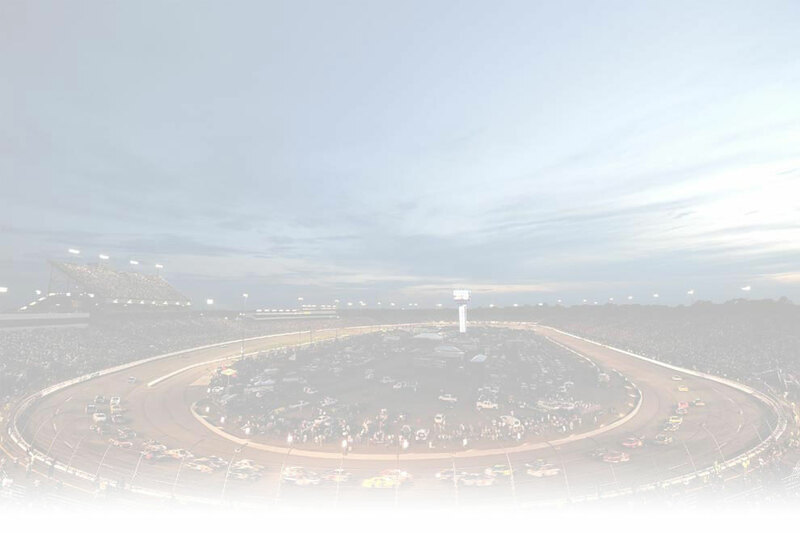 So enjoy the tight short track racing. I sure hope you have as much fun racing on it as all of us have in working to bring it to you.